The quarantine period enforced when the new birds arrived came to an end in the New Year. The new group had already been mixed with the original five by this point. A potential new pairing seems to be emerging from the mix: the four year old male, Yellow, and Red who lost her partner in the quarry, have been spending a lot of time together. Behavioural observations have been hampered due to the horrendous weather deterring the researcher from sitting in an exposed field for any periods of time. However, they have been able to glean information about relationships within the group and interesting behaviours. The established pair, Green and Mauve, have been observed caching food from the others. 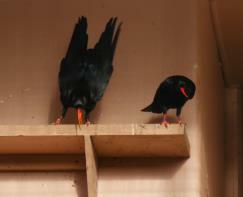 Although, in a confined space like the aviary, housing intelligent birds like the chough, nothing stays hidden for long! The gale-force winds, hail, and driving rain have also meant that it has been almost impossible to monitor the birds’ body weights each day. 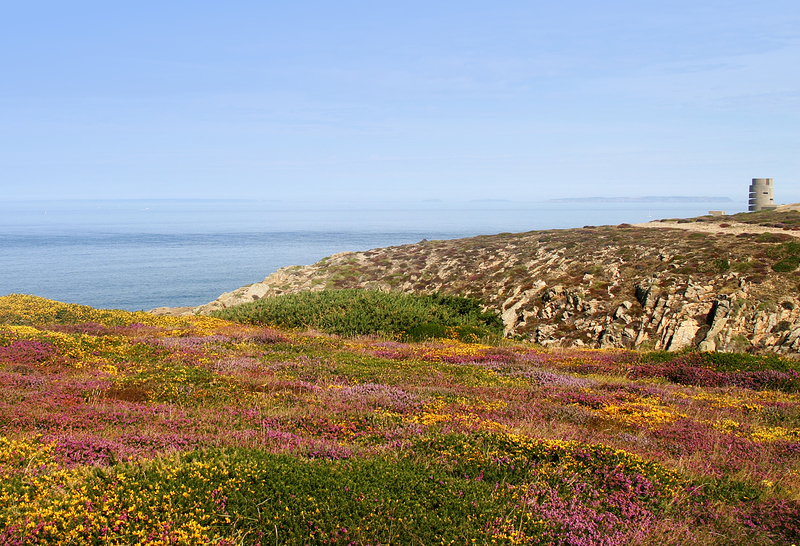 The electronic scales do not fare well in these conditions, not to mention the choughs themselves who are blown about. Weights that have been obtained suggest the birds are all healthy and in good condition. 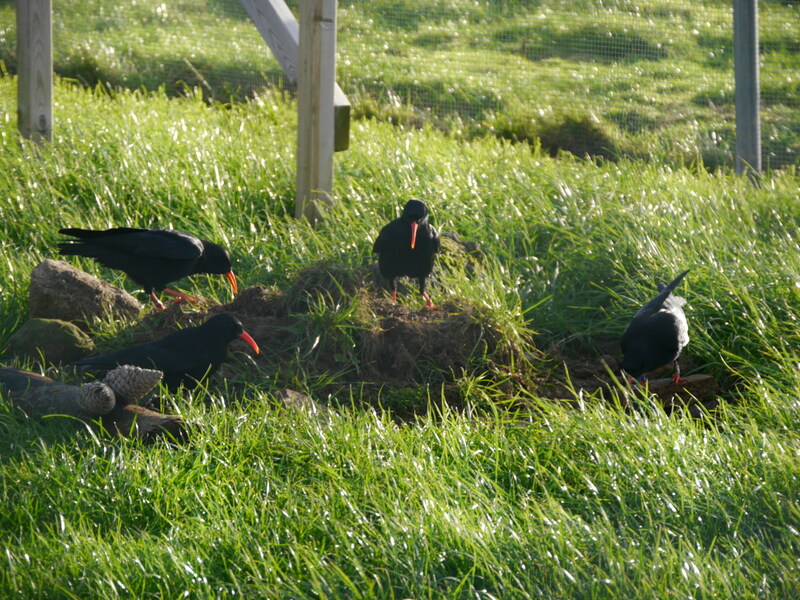 This is reassuring, especially when a few of the choughs have tested positive for gapeworm. The new youngster, WhiteR, was sneezing quite a lot towards the end of the month. He was caught up and locked into section 1B of the shed area. Faecal samples were collected over three days from him with a separate set collected from the group. Over these few days at least two others were sneezing but not as frequently. 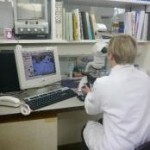 Whilst both samples tested positive for parasites the birds did not need to receive treatment. They showed no serious clinical signs such as severe weight loss. WhiteR was mixed back with the group straight away. This year Durrell’s breeding programme has an added bonus. Two juveniles, on loan from Paradise Park since 2011, are now of breeding age and have partnered up…but not with each other. Much like an episode from a TV soap the existing pairings have disbanded and three ‘new’ breeding pairs have been formed. 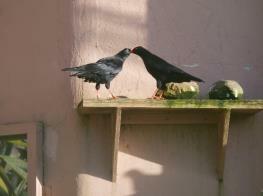 Tristan ‘divorced’ Issy and moved in with the young female (‘Black’). Arthur seized his opportunity and ditched Gwinny to return to his first love Issy. Not to be left out Gwinny took the young male (‘Mauve’) under her wing, so to speak. Whilst this dramatisation might be a little embellished, behavioural observations have shown the pairings to be accurate. 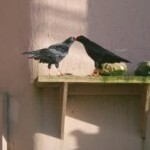 Mutual preening is a sign of courtship between choughs and both Tristan and Black and Arthur and Issy have demonstrated this within their pairs. Tristan has also been feeding Black. This is really positive news as this behaviour is typical of nesting pairs. Gwinny and Mauve have not been observed preening but they do spend the majority of their time together. 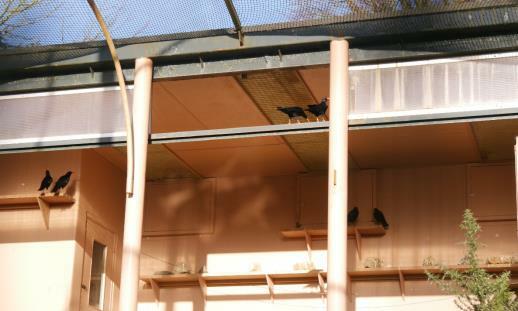 In order to maximise our chances of success this year the breeding aviaries at Durrell were set up earlier than normal. In the wild, nest-building usually starts around March. We want the new pairs to be in their own aviaries by the beginning of February. 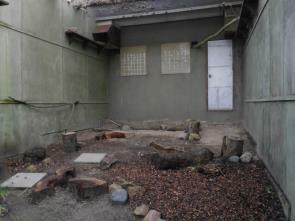 The breeding aviaries have been scrubbed clean, given fresh substrate and new ‘furniture’. Logs, rocks, and paving slabs have been added to attract insects, especially ants, and add a bit of structure to the otherwise minimalist aviaries. Each nest-box has been disinfected and new nesting material will be provided once the birds are moved in. 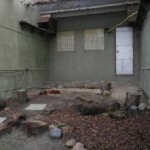 In order to accommodate the extra pair the flocking aviary will be converted to a breeding aviary. A camera will be fitted in the nest box so staff can see live images without disturbing the nest. 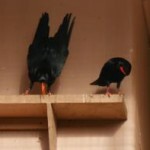 The choughs have been kept locked in the aviary over the winter months whilst the weather is unsuitable for releasing. They have also stayed confined to the aviary as half the group are without radio transmitters and could not be monitored easily once flying free. These four are the new arrivals and Mauve who lost her transmitter during her last outing in the wild. Biotrack are once again supplying the equipment which should take four to five weeks to build. all good news Liz, your doing a great job with these birds if you dont mind me saying so, hope fully we can look forward to some more settled weather now.